Other segments in this series have looked at Apple's commitment to building the world's greenest data centers, the company's jump start in construction at its Reno data center site, the massive scope of site preparation, the sophisticated water technology being installed and the futuristic data conduits that deliver iCloud's digital packets at the speed of light. Data centers are notorious power hogs. 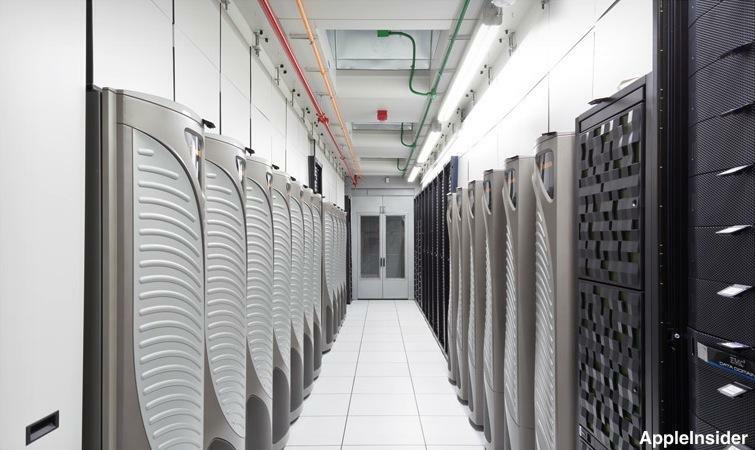 Essentially warehouses packed with stacks of servers (pictured above), Apple's facilities support billions of electronic transactions every day, requiring massive processing power. Densely packed racks of servers in vast buildings (pictured below) can consume as much electricity as a small town. Apple is now hosting 2 billion iMessages per day among its 250 million iCloud users, via both tens of millions of Macs and the installed base of 500 million iOS devices. In 2012, the company's data centers also handled an estimated $8.1 billion in iTunes media transactions (including around $4.4 billion in music sales and $3.7 billion in video content) as well as an additional $7.5 billion worth of App Store sales. Additionally, last month Apple reported coordinating the billionth download of free iTunes U educational content. The company's data centers also handle massive terabytes of iCloud documents and Photo Stream pictures, iOS device backups, emails, calendars and contact syncs, as well as supporting iPhone location lookups, iBooks, Maps, Siri and software updates for Mac OS, iOS and hundreds of thousands of App Store titles. A recent study by Strategy Analytics noted that Apple's iCloud is now the largest supplier of online media services for American consumers, equaling the usage of Dropbox and Google combined. The racks of hardware supporting all of these services not only consume large amounts of power to operate, but also generate lots of heat that must be evacuated from the densely packed equipment, a task that requires lots of additional energy. As a significant new player in data center construction, Apple faces the task of building without destroying the environment. 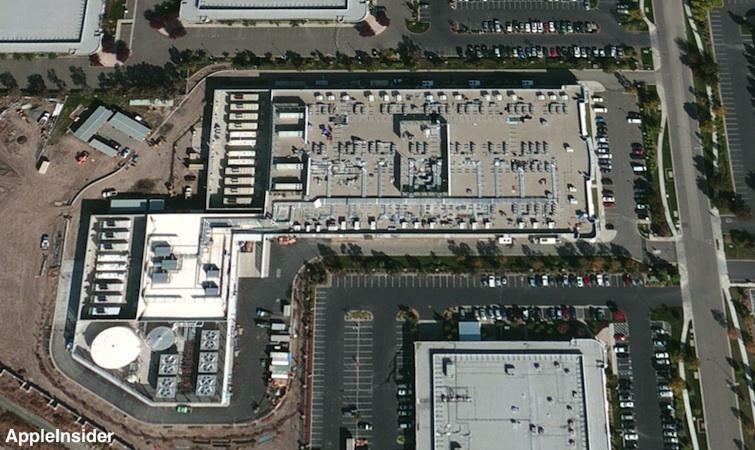 Apple entered the data center business with its 2006 acquisition of a mothballed, 107,000 square foot facility originally built by WorldCom/MCI for web hosting. That Newark, California facility (shown below), located about a half hour drive from Apple's Cupertino headquarters, was originally built in 2001, just after he collapse of the dot com bubble. Prior to Apple's purchase, it had never actually been used. As part of the company's "net zero energy policy," Apple states it has "optimized energy use" in that facility, while it has also "designed new facilities from the ground up with energy efficiency as a fundamental principle." 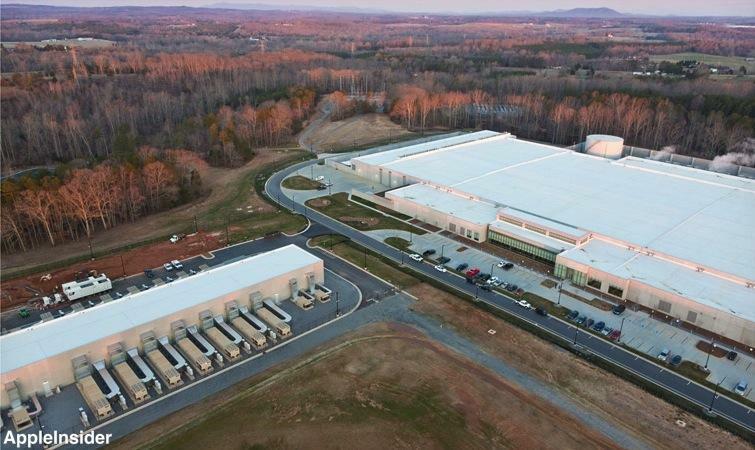 In 2009, rumors began to swirl around the company's first custom built data center, located in Maiden, North Carolina (pictured below). 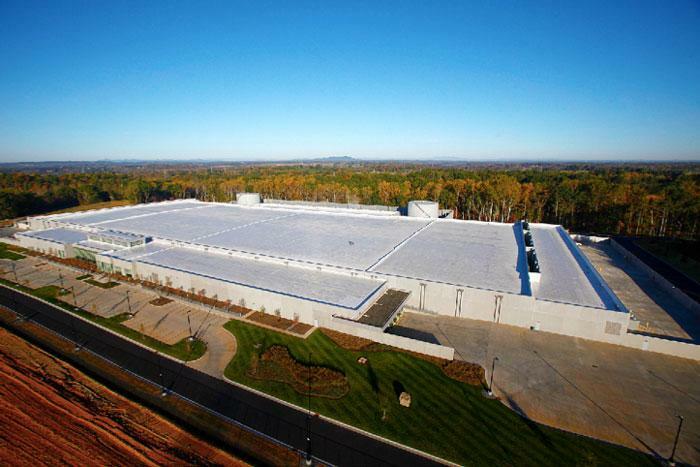 Apple now notes that it "is the only data center facility of its size and type to have earned LEED Platinum certification" for environmentally efficient and sustainable design. LEED (Leadership in Energy and Environmental Design) certification awards "points" based on a program developed by the U.S. Green Building Council, with respect to "Sustainable Sites, Water Efficiency, Energy and Atmosphere, Materials and Resources, and Indoor Environmental Quality." There are four levels of certification, with Platinum being the highest. Lessons learned in the design and construction of the Maiden facility are now being spread to two new data centers now under construction: Apple's third data center in Prineville, Oregon and a fourth in development near Reno, Nevada.